These questions indicate the need to acknowledge that diversity is a part of who we are as a community. This outreach is not an indication of our divisions as much as it is an indication of the beauty of our diversity. We need look no further than Scripture to see the place of diversity in the church. St. Paul in his first letter to the Corinthians reminds us of who we are as members of the body of Christ: “As the body is one though it has many parts, and all the parts, though many, are one body, so also Christ. For in one Spirit we are all baptized into one body, whether Jews or Greeks, slaves or free persons, and we were all given to drink of one spirit” (1Cor. 12:12-13). St. Paul’s message resonates for us today as we face the new reality of the church as being diverse within its unity. Recognizing and addressing the need to have leadership reflect the face of the faithful has at times been a slow process. Our diversity is our strength and our beauty. We are a “patchwork quilt” of many pieces and each piece brings with it its own beauty that should not be lost within the overall quilt. Our Holy Father, Pope Francis, has reminded us that the shepherds must take on the smell of the sheep. By that, I believe that he also means that the shepherds should also look like the sheep. 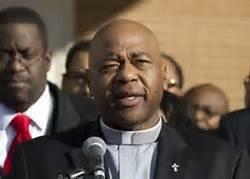 As I look around me, today, I do not see a clergy and religious that reflect the reality of our present demographics. In this age of the New Evangelization, it is very important that the actions of the Church match the words of the Church. If the New Evangelization is to be a new beginning, then those who lead must be culturally, racially, and ethnically representative of the faithful. How can this be done? The United States Conference of Catholic Bishops (USCCB) is involved in a number of efforts to help. For many years, I have served on the planning committee for the Diversity Outreach Initiative (DOI) at Catholic Social Ministry Gathering. The goal of DOI is to develop leaders from diverse Catholic communities for ministry in the Church. The initiative expresses our commitment to strengthen the Church’s social ministry by reaching out to Catholic ethnic, racial, and disability communities and encouraging members to lift up the richness and diversity of their gifts in our shared mission. The USCCB has also adopted several priorities to assist ministers in the recognition of cultural diversity as a reality in the Church today and how it can be lived on a day-to-day basis. The USCCB Committee on Cultural Diversity in the Church has taken up this challenge and created a way to begin to address ministry to the faithful in a more useful way. The result is the “Building Intercultural Competence for Ministers” (BICM) program. The aim of BICM is to foster sensitivity to the various cultural, spiritual and worldviews that all who minister in the church will encounter in the “vineyard of the Lord.” The committee has identified six cultural “families” to be ministered to in the United States: African Americans, Native Americans, Asia and Pacific Islanders, Hispanics/Latinos, migrants/refugees/travelers, as well European Americans. Ministering with sensitivity to the culture of those we encounter is one way to start to reclaim and to reactivate the missionary call, which is the very core of the life of the church. If we are to grow the church in the “fields” we wish to evangelize, we need to actively grow the leaders from among those we evangelize. This means that our seminaries must be actively seeking vocations from men who come from those who make up the faithful in our area. We cannot just invite them, we must go out and “make disciples”. Our diocesan offices must be populated by people who look like the faithful. We must be all things to all people. The church must embrace our diversity as strength and not as a weakness. We must thank God for the wonder of the diversity of his creation and use it as he intended, so that all may be one and share his love with all. Deacon Al Turner, MTS, is the former Director of the Office of Black Catholics for the Archdiocese of Washington and is currently assigned to St. Joseph Catholic Church in Largo, MD. Learn more about building unity in diversity and developing diverse leaders at We are Salt and Light, a project of Justice, Peace and Human Development/USCCB. Well said! A concerted effort is needed for our Church to reflect the Body of Christ. Yet, it will happen when leaders think about who’s not represented and change that. It will happen when leaders cast a wider net for participants at national conferences, on diocesan commissions, parish and diocesan staffs, event planning teams and everywhere. Opportunities are all around us to recognize, utilize and when necessary, groom diverse leaders. We just have to do it because we’re better together! I believeyou can evangelize the whita american too. not only blacks, latinos and asian peope. Need a lot a work to do with the white americans…normaly they are christians from other denominations..lie baptis, lutherans , anglican etc.